While the sight of a child sucking the thumb may evoke an image of innocence, the harmful effects of prolonged thumb sucking can be severe. If the services of a dentist or orthodontist become necessary to address the problem, those effects involve great effort, emotional impact, and high cost. Several techniques are available that attach a mechanical device by wires to rear molars, extending to the front of the mouth. These devices work behind the upper front teeth at the roof of the mouth to disrupt the pleasure of sucking on the thumb. One of these, the hay rake, has short “spikes” or prongs in the middle, just behind the front teeth, intended to cause discomfort when the thumb is inserted; namely, the sharp prongs literally hurt the thumb. A very similar device is the intraoral crib (also called palatal crib), but instead of spikes it uses a set of metal rings or bars behind the upper front teeth, also to disrupt the pleasure of sucking the thumb. Once the palatal crib is inserted, a dentist may leave it there for several months, so a child may have to live with these kinds of devices (and their subsequent discomfort) for long periods. The blue grass appliance(the name comes from being invented in Kentucky and used for horses) is a more comfortable variation on the hay rake. It is similar in the method of attachment, but instead of simply disrupting insertion of the thumb, this device also provides an alternative behavior. The bluegrass appliance contains either beads or a short Teflon roller, which can be rotated with the tongue. With this device, the child is expected to roll the tongue on the beads or roller instead of thumb sucking. If thumb sucking has not been stopped soon enough and damage occurs to the teeth or jaw, the expensive services of an orthodontist are required. Most people have seen braces, the standard method of straightening teeth. Although there are various kinds of braces, most use brackets,a component of braces consisting of small metal or ceramic objects placed on each tooth. The brackets transfer the pressure from an attached wire to gradually pull the tooth into the desired position. Various wire systems are also available, one of the newest of which is memory wires, made from “memory” metal (developed for NASA). This wire exerts constant pressure on the brackets without the need for periodic tightening by the orthodontist. Another wire device is the quad helix, attached to the upper teeth from behind and exerting pressure to expand them. When braces are applied, they may be worn on average from eighteen months to two years, though longer sometimes happens. During that time, periodic visits to the orthodontist are necessary. 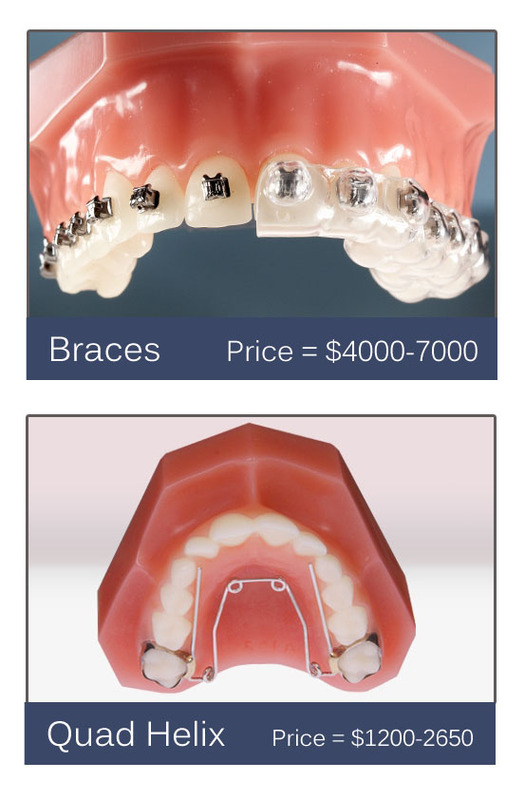 Full orthodontic treatment, with the application of braces, may cost from $4,000 to as much as $7,000, and even a less comprehensive procedure, such as inserting a hay rake or crib, can cost hundreds of dollars. There is an alternative to requiring the services of an orthodontist because of damage from thumb sucking. It is possible to avoid hay rakes, cribs, braces and brackets, trips to the orthodontist office, and the notable expense of these services, not to mention the pain and discomfort the child will experience from having to live with these devices implanted in the mouth. Stopping thumb sucking early means that none of this has to happen. TGuard is recognized by dentists, orthodontists, and pediatricians, as a painless and cheap method to stop thumb sucking and prevent the consequences that come from it. This entry was posted in Blog and tagged correct damage, crib, dental devices to break thumb sucking habit, hayrake, intraoral, orthodontic products, thumb sucking. Bookmark the permalink.